My Father passed away a few years ago. He built a Thistle Sailboat from a "kit" in the late 1960's. It was sailed very little. For part of the boats life, it was stored outside and for most of its life, it has been stored inside. During the times that it was outside, the cover was not put on correctly and now there is some rot where the guy wires go through and in the stern corners. The hull is black fiberglass. The hull is very dirty but in good shape. Having always been stored indoors, the main and jib sails are in great shape. The gold aluminum mast is in great shape. The wooden boom is in great shape. The trailer is functional but very rough. 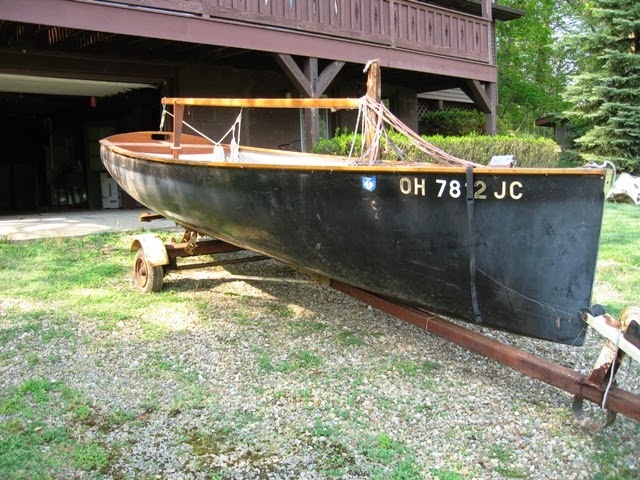 The boat is currently being stored in a garage in Brewster, Ohio 44613.